The Somerset Railroad's primary customer is the Kintigh Generating Station, a 675 megawatt coal-fired power plant. The plant itself is right on the shore of Lake Ontario, right along Route 18...and their spur runs south from there. The Somerset RR, as well as the plant, is owned by AES Corp and operated by CSX as the Somerset Secondary. Coal trains from mines on the old Monongahela RR run via Youngstown, OH and Erie PA to Buffalo, then up the Niagara Branch to a point called the Tuscarora Wye where they swing off onto the Lockport Branch, travelling east to Lockport, then onto the Somerset Secondary. CSX six axle power is common on these trains which are symbolled V829 to V834. Somerset has a GE center- cab at the plant for moving cars, etc. 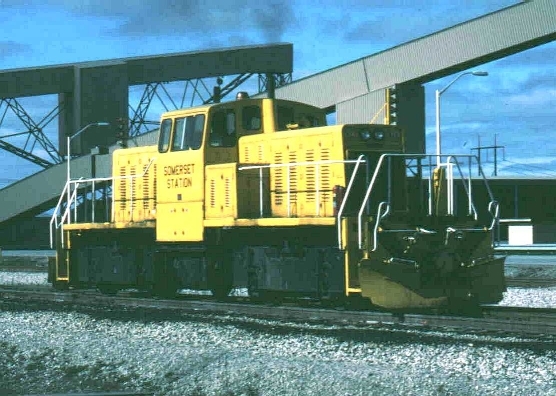 The Somerset RR also owns 428 rotary-dump gondolas.